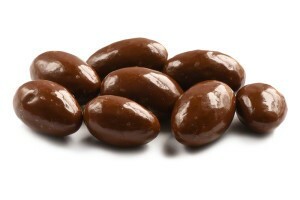 These cocoa covered almonds have the perfect amount of chocolate flavor to complement the nutty, buttery flavor that make almonds one of the most popular and frequently eaten nuts. They are sweet enough to be enjoyed as a healthy dessert and can satisfy your craving for a sweet snack. They’re a delightful indulgence that make snack time a special occasion. Dry Roasted Almonds, Natural and Artificial Flavors, Cocoa Powder (processed with alkali), Potato Starch, Modified Food Starch, Salt, Acesulfame Potassium, Sucralose, Contains Almonds. Light dusting of semi-sweet cocoa powder. Makes a normal almond into an occasion. Really good. Ohhh!!! these are absolutely delicious. Almonds taste fresh and the chocolate dust is not overpowering. And healthy too. Just the right amount of cocoa and the almonds are crisp and fresh. These are my favorite; arrived safely in 3 days.